I would love to bake desserts every week (in fact I would love to bake almost everyday), but the butter, sugar and the occasional chocolate are contributing to the disappearance of my waist (thankfully it’s still here). As I’m not in office most of the time, I can’t bring the baked goods to office and share the fats goodness with my colleagues. Today’s recipe is adapted from Bobbi, from Bam’s Kitchen. Bobbi creates all these amazing international dishes that her kids all love. I’ve seen Korean, Chinese, Western, Italian and Thai dishes being featured on her blog, all look mouthwatering delicious! She also revamped her site recently, and I LOVE her search page – I can search ingredients, difficulty levels, cuisine type… very useful! 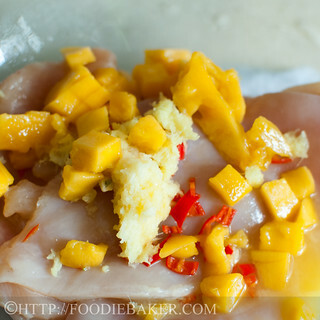 When Bobbi posted her Tropical Spa Mango Chicken recipe recently, I was intrigued. 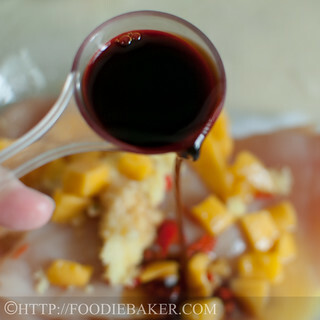 Mangoes, especially Thai mangoes, are one of our favourite fruits. These bright, yellow, lovely fruits are sweet, sticky and juicy. If not for the fact that they are pretty heaty, I would love to eat them everyday! I usually won’t use chicken breast in a dish as a main course as it’s pretty dry and tough, however, I know the lime juice and ginger will help tenderize the meat so I still sticked with it. (Another exception is when the chicken breast is served with a sauce, like this very yummy pan-fried chicken breast with mushrooms.) I also added a bit of soy sauce to colour the chicken as well as to enhance the marinade. The resulting chicken does not have a very pronounced mango flavour, probably because I used a bit too much ginger and the lack of the grilling sauce, but it was still pretty tender, juicy and gingery. 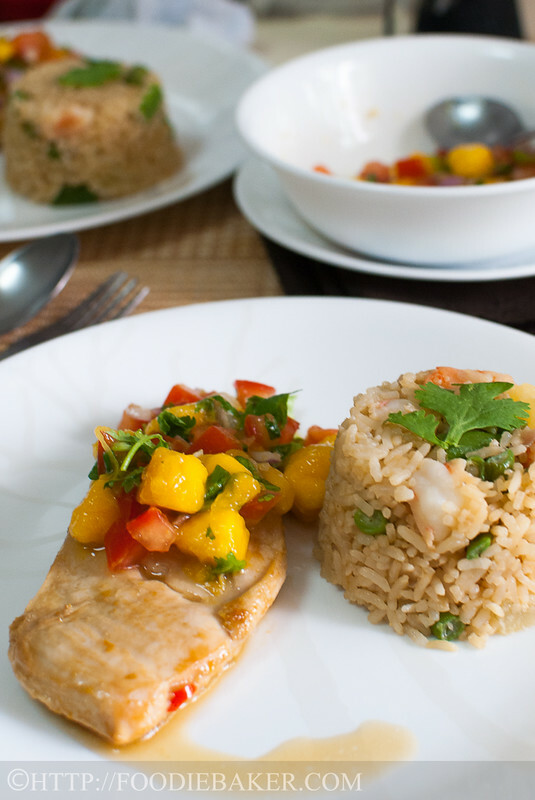 What brings this dish up a notch is definitely the mango salsa. This salsa, though I modified the recipe a little as I don’t have some of the ingredients, is every bit AMAZING. The bite of the raw red onion, the fragrant and crunch of coriander, the sweetness and juiciness of the mango and tomato and the tang from the lime all combined together into one very delicious concoction. I hope I’m making you all hungry enough to go cook this dish! 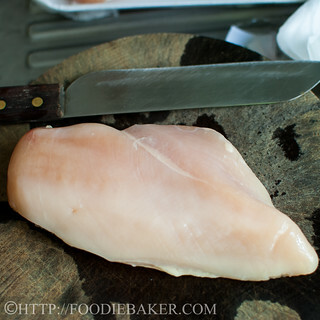 1) Rinse and pat dry a chicken breast. 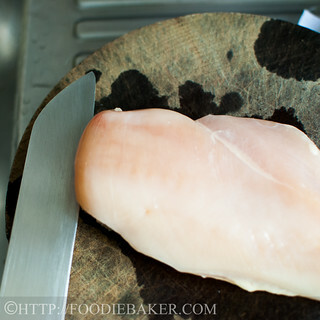 2) Slice the chicken breast. 3) To get 2 flat pieces. 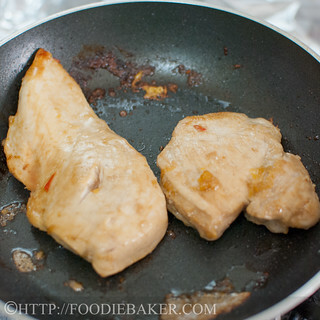 4) Alternatively, pound the chicken breasts until they are of even thickness. 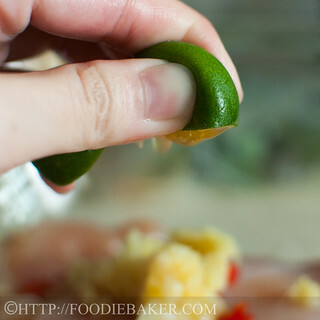 5) Grate a ginger, a little garlic and snip in a chilli padi 6) Squeeze in a little lime juice. 7) Add in the mangoes (I decided to mash the mangoes later on). 8) Add in soy sauce. Cover and marinade. 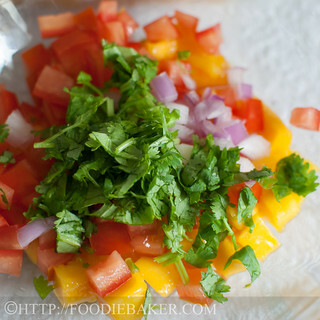 9) For the salsa, chop some tomato and mango. 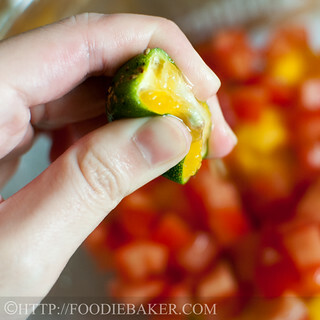 10) Squeeze in some lime juice. 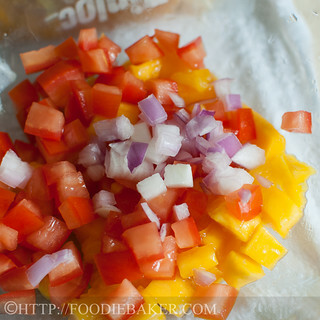 11) Add in some chopped onion. 13) Followed by chopped cilantro. 14) Give it a toss and adjust the seasonings. I decided to add more onion for more crunch. Place in the refrigerator, covered, for at least 1 hour. 15) Pan-fry/grill the chicken till cooked through. Then serve with the salsa! 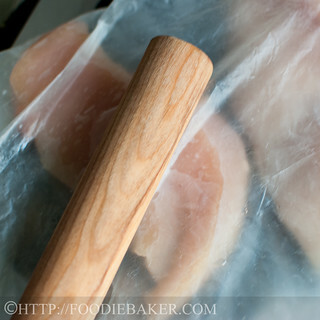 Chicken: Rinse and pat dry the chicken breasts with paper towel. 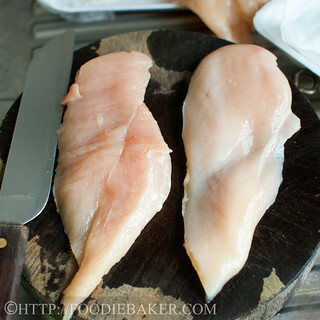 Using a sharp knife, split the chicken breasts into half to get a total of 4 thin slices. Alternatively, cover them with a layer of baking parchment or clingfilm and pound them with a mallet/rolling pin until they are of even thickness. Combine the chicken with the rest of the ingredients and leave it to marinade for a couple of hours, or overnight if desired. 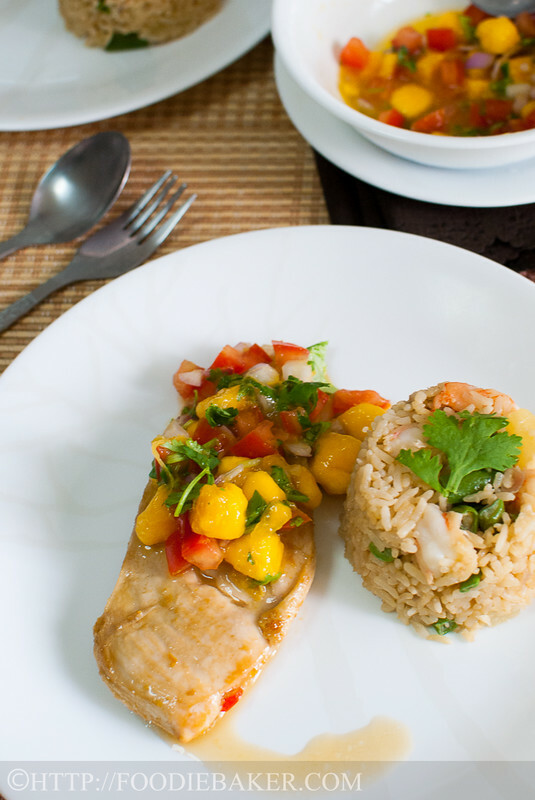 Salsa: While the chicken is marinating, combine the mango, onion, tomato and juice of 1 lime together. Taste and add more lime juice if desired. Stir in cilantro leaves. Cover and refrigerate for at least 1 hour for the flavours to mingle and get friendly. 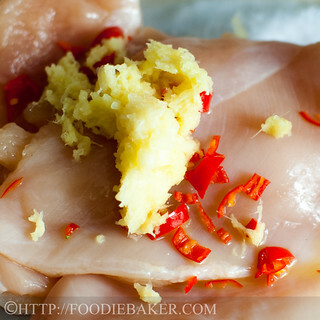 Back to the chicken: Grill or pan-fry the chicken until cooked (discard the marinade). 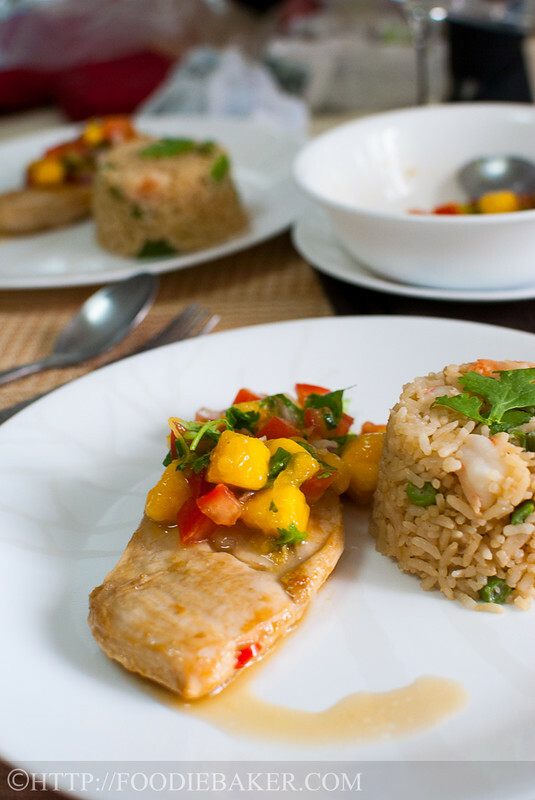 Serve with salsa and rice. You can use the normal lime instead of key lime. I will substitute the key limes with Tahitian lime if I don’t have key limes on hand. Tahitian limes are bigger so you will need lesser, but they are equally fragrant. When making the salsa, do chop the onion a little bit smaller than you normally do as red onion is a bit more spicy, but a lot more fragrant. You can substitute it with yellow onion if you can’t find red onion. I’m not a huge fan of Italian parsley, but I sure love coriander very much, so I added a bit more than a handful. If you don’t like coriander, regular parsley will work fine too. 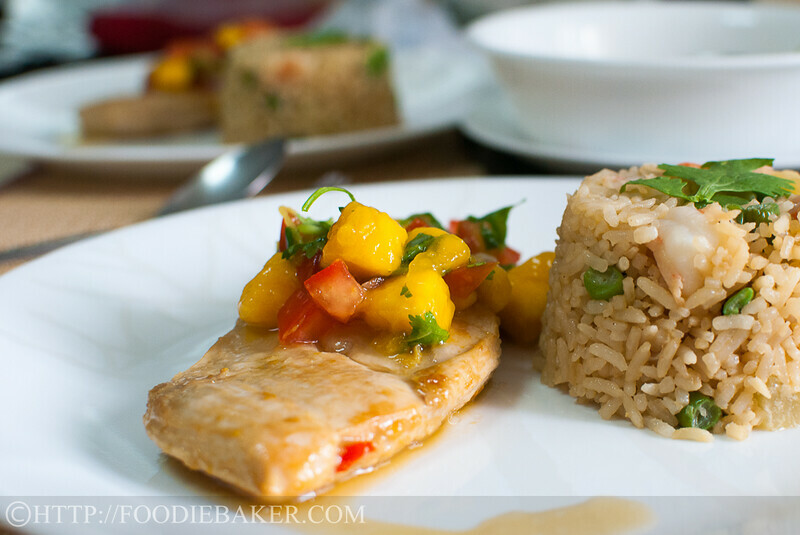 Wanted to let you know that your mango salsa chicken is in the top five “most viewed” this week. Your post will be featured when See Ya in the Gumbo goes live this evening! Beautiful dish! No need to spend a fortune going to fancy restaurants in Singapore when you can recreate such a gorgeous and fine-dining worthy dish at home! Yum! Stopping by to let you know you have been featured at One More Time Events. Thank you so much for sharing. This looks delicious! Thank you so much for sharing the recipe. I’m so glad you came by and shared at Transformed Tuesday. Got anymore for dinner? Looks so delicious! Love mangoes! I can eat a box by myself 🙂 You recipe looks scrumptious and I pinned it immediately ! I also love the step-by-step photos you added to your post 🙂 Thank you for sharing at our ALL MY BLOGGY FRIENDS party! I simply love mango salsa on anything. This looks great! I am glad you like my new advanced search function. It really is a great functionality. You can do an advanced search for some ingredients you have on hand and want to make for dinner and exclude the items you don’t want to use want to use (maybe your picky teenager does not like mushrooms). You can search for recipes that are specific for your food allergies or your health concern. It is a work in progress but I am really having fun with it. Wishing you a super week. If you get a chance, I am having a salad potluck on Bam’s Kitchen so please stop on by. You’ve created a very attractive — and enticing — plate of food, Jasline. 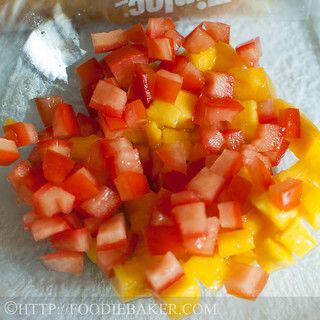 Mango salsa always adds such a nice fresh component to a dish and if you used a recipe on BAM’s site as your base, it must be delicious. See? Good things result when blogs collide!!! This is a nice, light summery dish. And very pretty. I like chicken topped with salsas or relishes. Thank you for joining See Ya in the Gumbo this week. It’s good to have you stop by! I could eat that mango salsa on it’s own, it looks delicious. I just love mango and also could eat it every day. 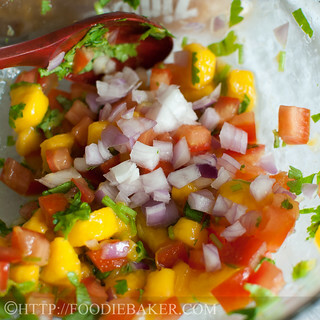 Really love the idea of the mango salsa for summer. I’m with you and the ingredients you’ve used as otherwise this could be too fussy.